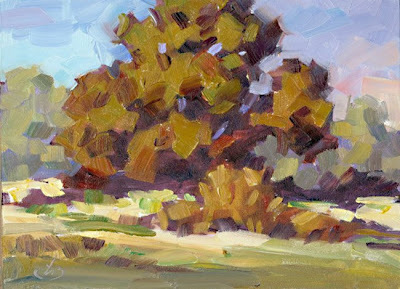 I was captivated by the shape and structure of this massive oak, and sought to express the scene with bold and powerful brush strokes that echoed the strength of the tree. I feel this one has lots of punch for a small painting. Hope you like it. By the way, if you are Southern California this coming weekend I invite you to join me for a Saturday morning plein air workshop. Email me for details: tombrownstudio@cox.net. This is a nice one today. That tree has some real form and solidity to it.